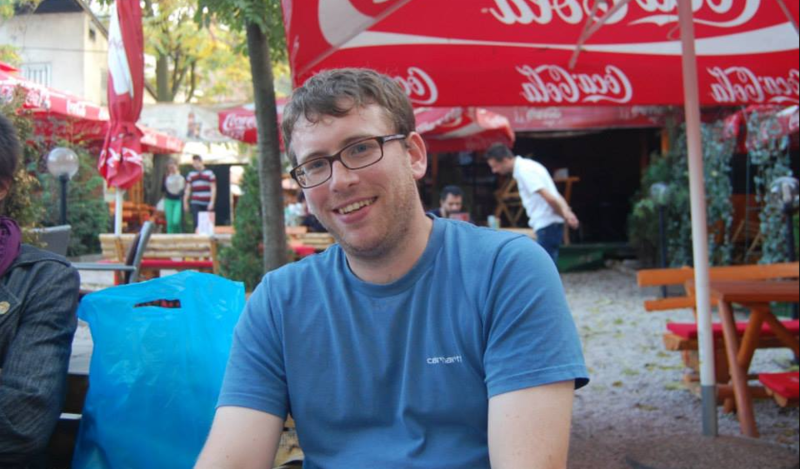 Andrew Lawlaer objavio (za sada u elektronskoj formi) istarživački rad o 34 obilježja posvećena Narodnooslobodilačkom ratu u Drugom svjetskom ratu u Visokom. Ovaj rad (knjiga) neprocjenjive važnosti za istoriju Visokog i BIH prikazuje i kako se Visoko ponijelo prema 34 obilježja iz NOB-a, od kojih je samo nekolko ostalo u prvobitnoj formi (?!). Ovaj rad i buduća knjiga pisana na engleskom jeziku predstavlja jedno od najznačajnijih djela o modernoj istoriji Visokog. The report I have written on the current condition of monuments and memorials to the People’s Liberation War and Revolution for Visoko municipality is finally online. It’s a bit longer than most others, at 80+ pages, and covers a total of 34 monuments and memorials. According to my records, I started working on this in late January 2017, so it’s been almost 2 years in the making. The creation of this report wouldn’t have been possible without the invaluable help of Ivan Kitic, Zdenko Antovic, Lejla Dzambazov and Slaven Istuk, among others. I feel that it’s also worth giving a quick summary of the state of the memorials in this municipality in this post. 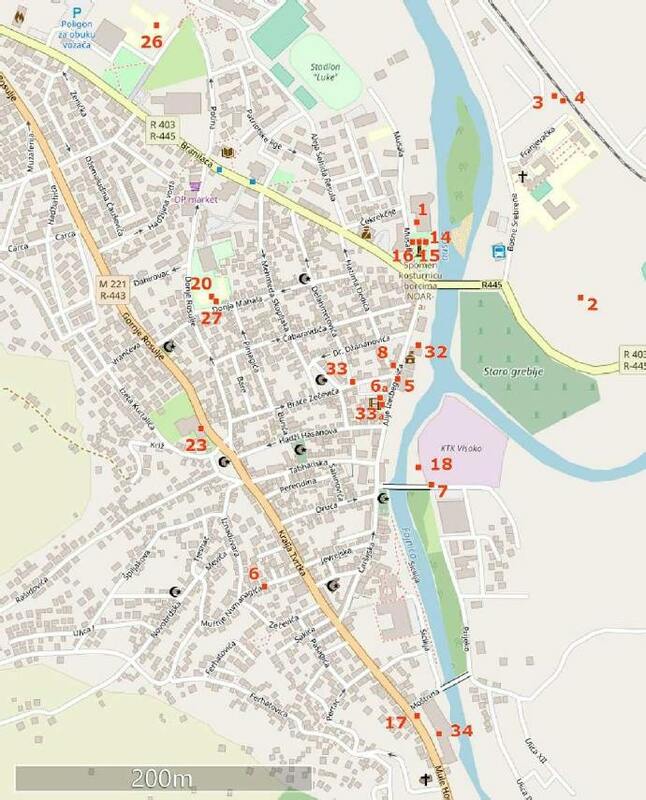 Of the 34 monuments and memorials to the People’s Liberation War and Revolution on the territory of Visoko municipality, a large number have been destroyed or removed. While a small number (seemingly two memorial plaques and one monument) were removed prior to 1992, the overwhelming majority of monuments and memorials in the municipality seem to have been removed or destroyed during or in the wake of the 1992-95 war. – Of 13 memorial plaques, only 5 are still in situ. – Of the 13 busts, not a single one is still in situ. – Of the 2 bronze memorial reliefs, neither are still in situ. – The one memorial fountain in the municipality (in Buci) survives, and is in very good condition, having been restored in recent years. – Of the 3 monuments and artistic compositions, one is known to have been removed prior to 1970, one is in good condition (although neglected), while the third has disappeared without trace. – Finally, the 2 ossuaries created upon the territory of the municipality both still exist. While one is in good condition, and has recently been restored, the other is in a poor state of repair, and will, without intervention, probably reach a level of damage where it is beyond repair in coming years. 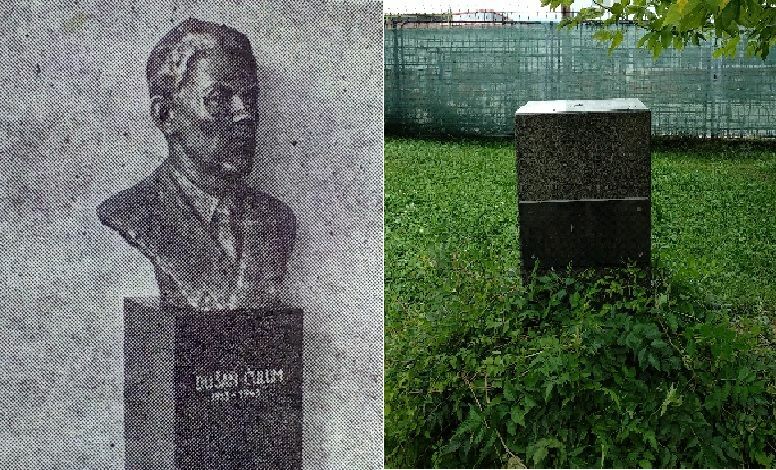 Below is a ‘then and now’ picture of the bust of Dušan Čulum, at Mula Mustafa Bašeskija (formerly Visočko-Fojnički Partizanski Odred) elementary school, in Donje Moštre, Not only has the bronze bust (the work of local artist Ranko Milanović, unveiled in 1974) been removed, but Čulum’s name has been intentionally covered at a later date using a small stone plaque. This isn’t just neglect of the municipality’s heritage; it’s active erasure of the past.